I now sell my work online! 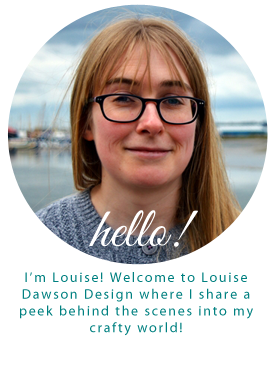 I just wanted to let you know that Louise Dawson Design jewellery is now available to buy online on folksy.com - I've got a couple of pieces available to start with, but keep an eye on it because I will be gradually adding more pieces. 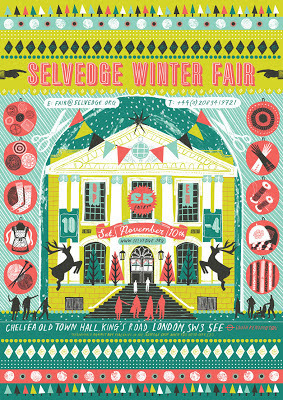 It's all very exciting! Each piece comes gift boxed too, which is ideal for Christmas! 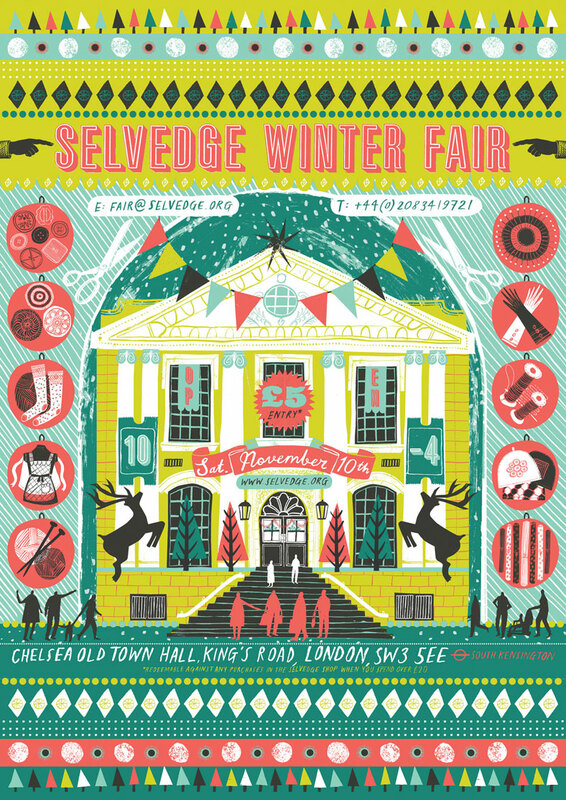 A very big thank you to everyone who visited me on my stand at the Selvedge Winter Fair in London earlier in the month, I met lots of lovely people and very much enjoyed the day. Here's a few pictures! I wanted to give my display some height and I found the perfect way to do this with a wooden stand I found in a second hand shop and painted white! I'm currently making a new addition to my blog- check out the gallery page. Stitch wise at the moment I'm making a little collection of work for the Jessica Muir Gallery in Long Melford, Suffolk (images soon) and I'm planning a joint venture at Spitalfields Market in mid December, I'll keep you posted! Also, look out soon for some new experimental resin and fabric brooches coming soon. I'd like to share with you some previous work to give some background to my working process. I love to have the freedom to develop ideas without the constraints of making a functional piece and it is mostly through working in this way that the ideas for my jewellery are formed and developed. As you will know by now, my obsessions are knitting and felting and my main objective through my work is to explore the possibilities of these crafts and subvert wool as much as I can! 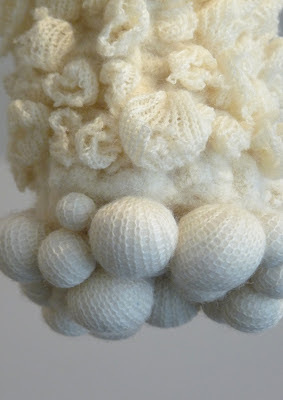 For my last main big project "Curiosity" I was lucky enough to have a month long residency in the Benham Gallery at Cuckoo Farm Studios, which was essentially an exploration into the sculptural and textural possibilities of knit and felt. This subject is something I want to continue to return to in order to explore the infinite possibilities surrounding this subject and I hope that one day I will have the time and the organisational skills (!) to work the two strands of my work, being the conceptual pieces and jewellery, side by side. Ultimately, in everything I make I want to ensure that there is integrity in the thought processes behind the pieces. I made this piece from two separate knitted tubes and Shibori felting experiments. The bobbles run all the way through the middle of the piece! The pieces were hung from the ceiling using invisible thread, creating an ethereal presentation. Once I get the Gallery section of my site up and running I can share more, but for now I hope this gives you some insight into how my work and my thoughts develop! When I'm not sewing and knitting one of my most favorite ways to spend my time is cooking (and eating!) lovely homemade things. I also love to forage for ingredients, and as I have a Labrador who is at her happiest out in the countryside (pictures of her to follow at some point, she doesn't like to sit still for long! ), dog walks provide a handy time to pick blackberries and apples, which is exactly what I did last weekend! Here is the result, Blackberry and Apple Gin which will be ready just in time for Christmas! This is how it looks now, just a simple combination of fruit, sugar and Gin, can't wait to try it! By way of news of the textile variety, I'm currently making lots of things for a London Textile Fair next month, I'll let you know more when the advertising is released! I love scouring second hand shops, flea markets and Ebay for pearly treasures I can up-cycle into my jewellery pieces, and here is a little look at my latest finds! I like to imagine the story of where these necklaces and bracelets may have come from, and I enjoy the challenge of re-inventing them into my work, juxtaposing them with new materials. Something old, something new! Looking forward to getting to work with these! I'll keep you up to date on the transformation of these pieces from junk to jewellery! Photo Shoot for my Online Collection! As I mentioned a while back, I've been busy working on a jewellery collection to sell online, and I'm excited to say that it's now ready! I had a brilliant photo shoot last week, and here's a little look at some of the pieces while I work away on setting up an online shop- watch this space, it's coming in the next few weeks! Thank you to Olivia for being a great model and thank you to Tara at Hammonds Photography Studio for taking the photos! Some new things! I have been experimenting with ways to make crochet jewellery using a wool and silk mix yarn, which has lovely draping qualities to add to the lacy effect I wanted to achieve. So, that sums up what's going on in the studio at the moment, lots of experiments! I'll keep you posted about these ideas and the other things I'm working on! I like to use recycled materials in my work as much as possible, both in order to reduce the environmental impact of my work, and also because I enjoy the challenge of creating something new by reinventing the old. 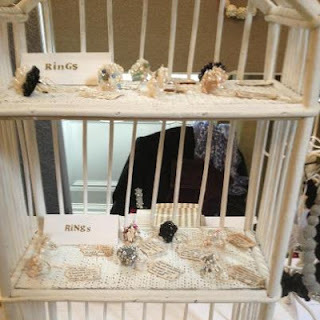 However, I have also developed a love of all things Swarovski, Freshwater Pearls and semi-precious stones, and through the combination of both of these themes, my "Something Old, Something New" theme has developed! These pieces combine recycled yarn and fabrics with sparkly Swarovski crystals. The Little fabric discs on the necklace and brooches was cut from fabric that once formed a display in a shoe shop window! I'm taking these pieces to the Warner Textile Museum shop in Braintree next week, along with some more bits and pieces! I don't get a lot of spare time to make non work related things, but this year I am determined to make some things for myself! I've been knitting this jumper for quite some time and I finished it this week. I'm hoping to get quite a few pieces knitted ready for the Winter- but with the weather the way it is, I may need to wear them before that! I'll definitely keep warm in the studio wearing this! I made this one from a pattern, but one of my aims for the near future is to create my own experimental knitwear collection- watch this space! Today I'd like to give you a little look inside my studio! I'm very lucky to have such a nice place to work in, and such a unique place too. There are about thirty Artists working in our community at Cuckoo Farm, Colchester, and it's really helpful to me to be working surrounded by like minded people. When the inside of my studio is looking a bit tidier I'll post some more images! I'm very grateful for the opportunities Cuckoo Farm has given me since leaving college, and my studio is an integral part in the process of making my work. These are just a few of the pieces that I've been making this week. Tomorrow I'll be transforming them into rings and they'll be all set to go off to the gallery! I stitch all the beads and stones onto the felt backing by hand- I am an obsessive embellisher! People are always surprised that I stitch them all rather than glue them on, but I think this gives the best results and I love the process of it. 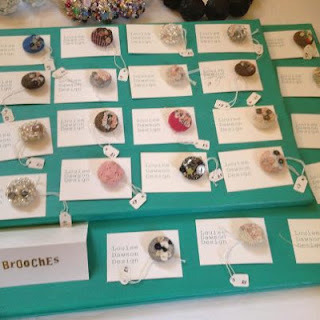 The big round rings are made from handmade felt beads which are then embellished- they really are statement rings! It's not a ring yet, but it will be! 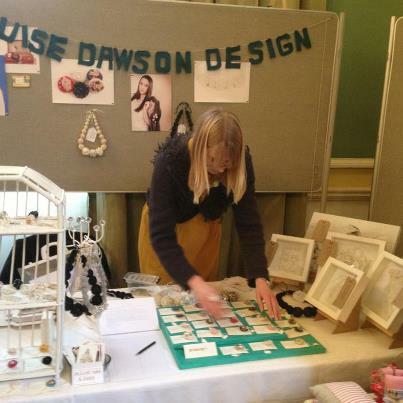 I also make jewellery to commission, so if there's something particular you'd like please contact me!